There are few things more discouraging to online shoppers than finding that the items they want are out of stock. As many larger, multi-store "omnichannel" merchants are adopting ship-from-store capabilities to counter the problem, pure-play e-commerce merchants need to make sure they don't lose out to their brick-and-mortar competitors who can more easily sell and ship products whether it is immediately available or not. There has traditionally not been much Internet retailers can do if they run out of product outside of offer some sort of digital rain check, but they can encourage users to revisit the website when the items consumer want are back in stock and once again available for sale. That's not easy, of course, as Internet retailers and e-commerce storefronts need to have a functional inventory management system in place that can handle those communications or take advantage of plugins, modules or extensions that can provide those capabilities. Back-in-stock notifications, while rare among the majority of merchants today, could serve as a powerful mechanism to limit shopping cart abandonment, drive engagement/sales and deepen loyalty. Fortunately, quite a few solutions exist to provide back-in-stock notifications. The InStockNotify app for BigCommerce, for example, replaces the out-of-stock message with an email field for customers to receive a notification that the product is back in stock. There are, of course, hundreds of e-commerce platforms on the market today so definitely check with your e-commerce solution provide to see what's available. Most provide at least one offering to serve up back-in-stock notifications - here is one for OpenCart, one for Magento and another for Nexternal. 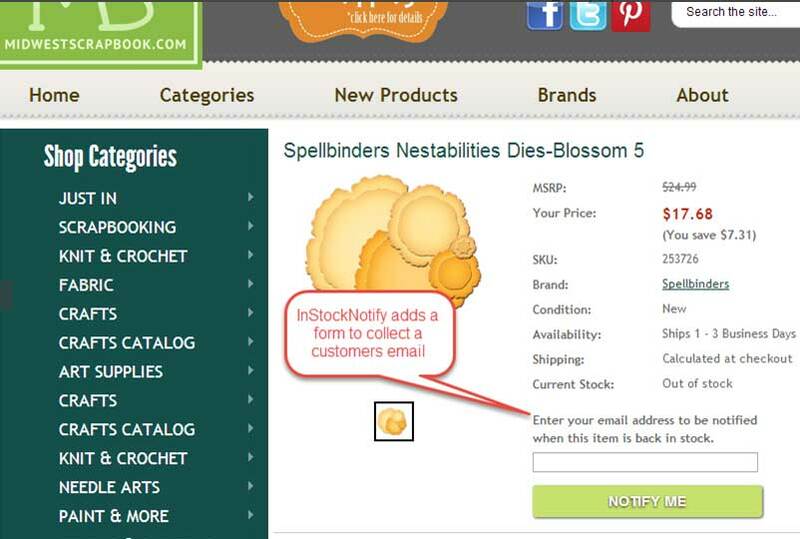 Are back-in-stock notifications something offering within your e-commerce presence? Join the conversation, share a comment below!